Have you experienced Soufeel? Purveyors of beautiful, quality silver and fashion jewelry for all occasions and gift giving, their premiere offering is their sterling silver European style charm bracelets. 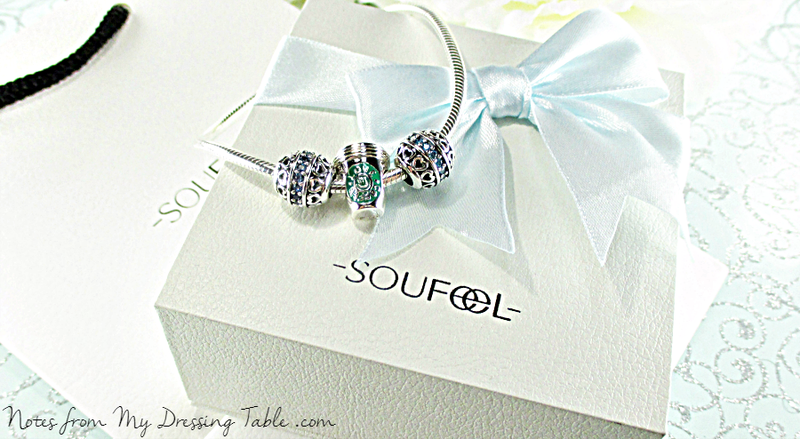 Modeled after the popular but pricey Pandora and Chamilia, Soufeel offers the style and selection without the high price tag. Soufeel offers the 925 Sterling Silver Basic Charm Bracelet, 925 Sterling Silver Charm Bangle Bracelet and Leather Charm Bracelets with Sterling Silver clasps in a variety of sizes to fit many and a huge selection of beautiful charms with and without sparkling stones to document important life events and milestones and show off your fabulous personal style. Soufeel contacted me and offered me a chance to select a bracelet and some charms to enjoy and love and share with my gentle readers. I assure you, this post would not have been written if I had found the quality of the pieces sent to me to be less than worthy. To begin, the packaging is lovely. Everything came packaged carefully and securely in plastic baggies to protect the silver from air and carefully wrapped in bubble wrap to guard from shock during the journey. Included in the shipping box is a heavy textured paper gift bag with a black cord handle and a beautiful box with a light blue satin ribbon and pre tied bow in case this is a present for someone you love. Tucked in the gift box is a black velvet pillow to present and nestle your beautiful jewelry piece securely. The bracelet will come in a plastic baggie along with four silicone stoppers and each charm is packaged in their own individual plastic baggies for shipping. A small black polishing cloth is included with each bracelet so that you can keep it bright and shiny. I chose a March Birthstone Charm, $19.95 and a matching December charm for my husband and son. For me I made the obvious choice of a Love Coffee Charm, $15.95. I did get a fourth charm which you will see, a little later on. These charms live on my Sterling Silver Starter Bracelet, 29.95. You can choose lengths from 6.30 - 9.06" long to fit many wrist sizes. The basic bracelet is a snake chain style with a clip clasp engraved with the Soufeel logo. The charms and bracelet are all sized to work with other European style charm bracelet components so you can mix and match, if you choose. I am so impressed with how weighty and substantial these pieces are. I didn't know what to expect then they arrived and honestly, my expectations weren't too high. When I opened the packaging and unwrapped this bracelet and these charms, the high polished shine, the lovely heft in my hand, the beautiful, impeccable finish and attention to detail; It was all there. When I put the charms on my bracelet, they slide smoothly without catching, dragging or scratching my bracelet. This bracelet feels lovely against the skin, I never feel a rough or unpolished spot. I am not showing pictures of this bracelet on because I am a moron and I over estimated my wrist size (measure, Erika!) and I requested too long a starter bracelet, it doesn't fall right on me and I was unable to get any action shots with which I was pleased. I bought a new starter bracelet that is in transit and I'll shoot pics of it, some day in the future, after I buy and load a few more charms on it. A What's on My Soufeel Charm Bracelet update kind of thing. Anyway, I am in love with my beautiful Soufeel Charm Bracelet and the three charms I already have. I can't wait to get my better fitting bracelet and to buy more charms. I have a huge wishlist! And... I'm probably going to need another bracelet, in the future to hold all of them. Ooo! Stacked charm bracelets! I'm down with that! And at their prices, it wouldn't be outrageous. Soufeel offers a free starter bracelet with a $99.00 order, free shipping on orders over $50.00 and many special prices and discounts on lots and lots of their beautiful and fun charms. 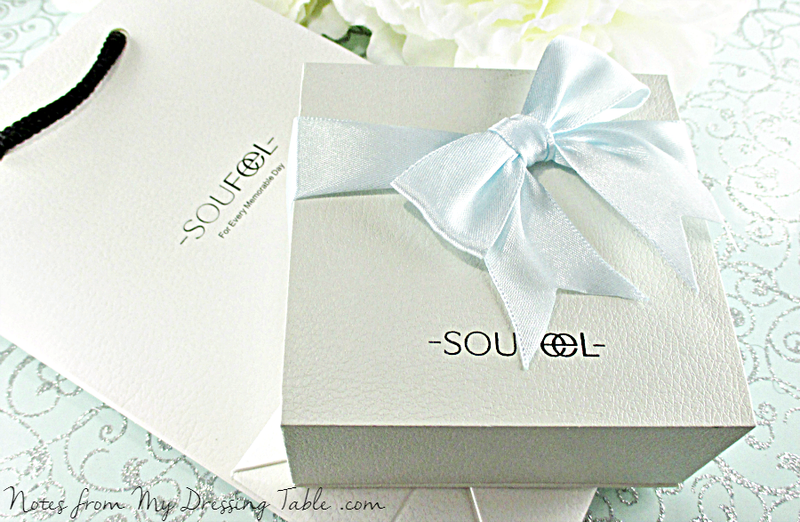 I am willing to bet that just about everyone would find something to love and cherish or enjoy giving as a special gift at Soufeel. 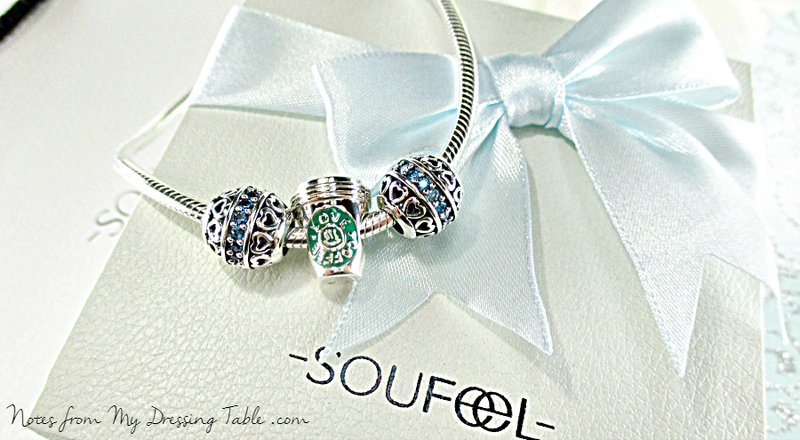 Do you own a Soufeel charm bracelet? How do you like it? OOOO That is SO pretty! I haven't tried any of this style of bracelet, but I think they are so pretty, and I love the customization. The lippie charm is adorable! That is one pretty bracelet! I like that you can customize it with your own picks of the charms too. I love the charms you chose, and the because they are covered with hearts, they are on my wish list. I love my Soufeel bracelet so much, I went back and bought more charms. I wear it just about everyday! Pretty! I used to wear bracelets all the time. With a baby that loves to grab stuff....I gotta be careful, lol! I've learned my lesson with dangly earrings already! So pretty! I think I like this better than Pandora. Thank you. So do I. It makes it so much more meaningful. T=I loved your charm choices. :D Those charms are like potato chips, aren't they? Yeah... When my son was little I pretty much put all of my earrings away. lol This bracelet is nice because the clasp is so strong that a little fist can't pull it off of your wrist. I thought it was a good choice. :D You're welcome and good luck! Thank you. I think it's adorable. And it's affordable, too. I've looked at Pandora, so many people have told me it is the be all of the charm bracelet world. They are nice but whoa! Their prices. And honestly, Soufeel stacks up and is far more affordable. Love the packaging and the lipstick charm is adorable! What a pretty bracelet. Their prices are so much better than Pandora too. Great giveaway. Omg the lipstick charm!! These are way prettier AND more affordable than Pandora! I love the charms you got! 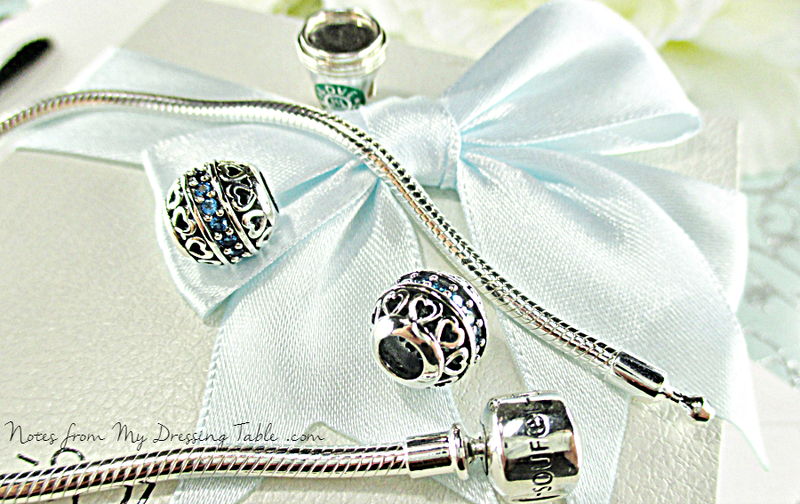 Such a cute pandora-like bracelet! Isn't it the cutest little thing? Thank you. I love the prices, I wanted a Pandora but I can't afford it. This, I can. The packaging is lovely! That charm is the best, isn't it? Wow such cool bracelets. I loved the Lipstick charm most. That is such a cute bracelet! Gosh this is so pretty! It's so adorable, isn't it?